Introduction - Northern Virginia Temporaries, Inc.
NVT Staffing empowers recruiters across the United States to find the most qualified candidates. NVT works with recruiters in our nationwide network. Our recruiters are rewarded for their efforts—much like the employees we place. First, recruiters must register with NVT Staffing to gain access to our vast internal network of opportunities. Our clients then leverage their own preferred talent search networks; recruiters augment the search by identifying and interviewing candidates. This assures that the employee meets the clients’ needs. After recruiters present the candidates’ qualifications and documentation to us, we facilitate a second interview—along with skill testing and background checks. When clients hire candidates presented by our recruiters, we pay commission to reward recruiter effort. 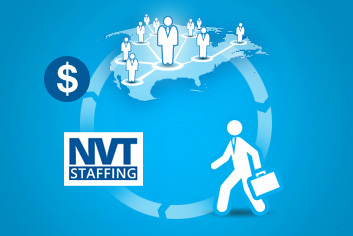 Recruiters can double their income when they post a job opportunity with NVT Staffing. I normally do not promote vendors or subcontractors, however, I have a temp agency that we currently use that has provided us with fantastic customer service.